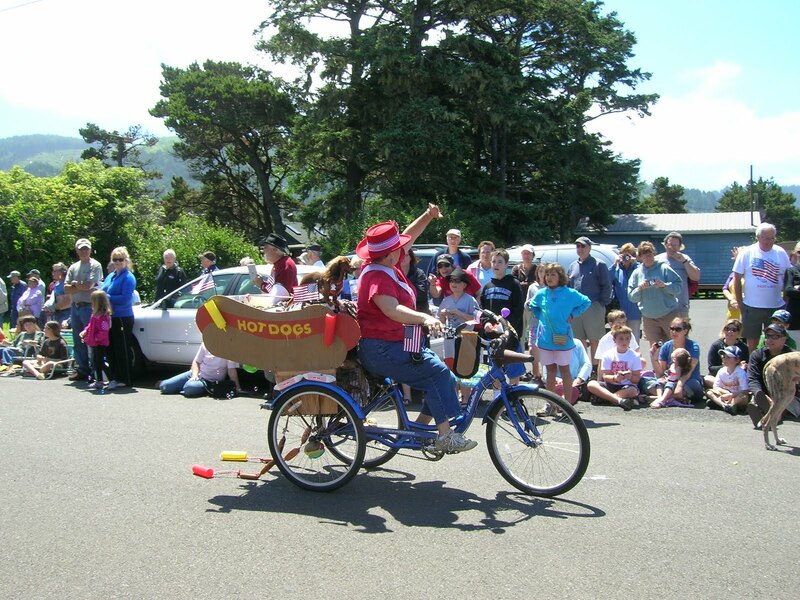 A parade, pies and pups filled the streets of Yachats (pop. 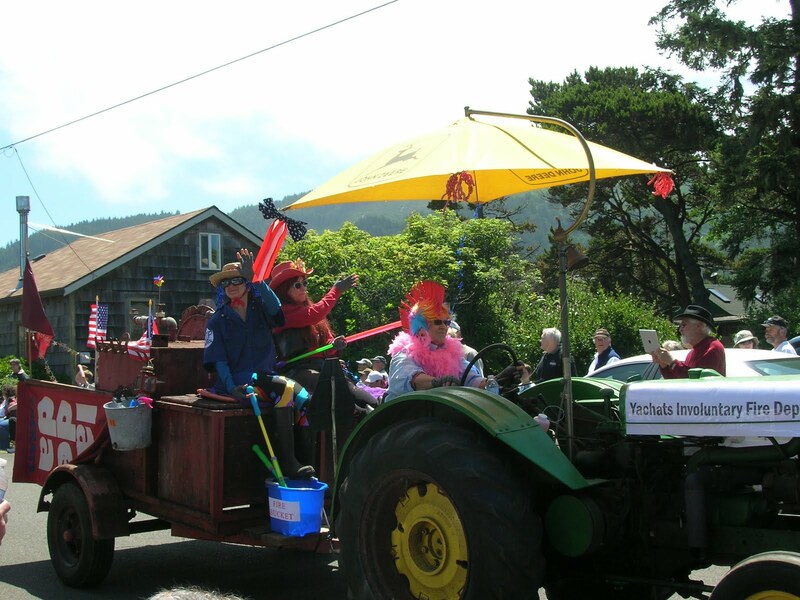 749) yesterday for the annual La De Da parade. 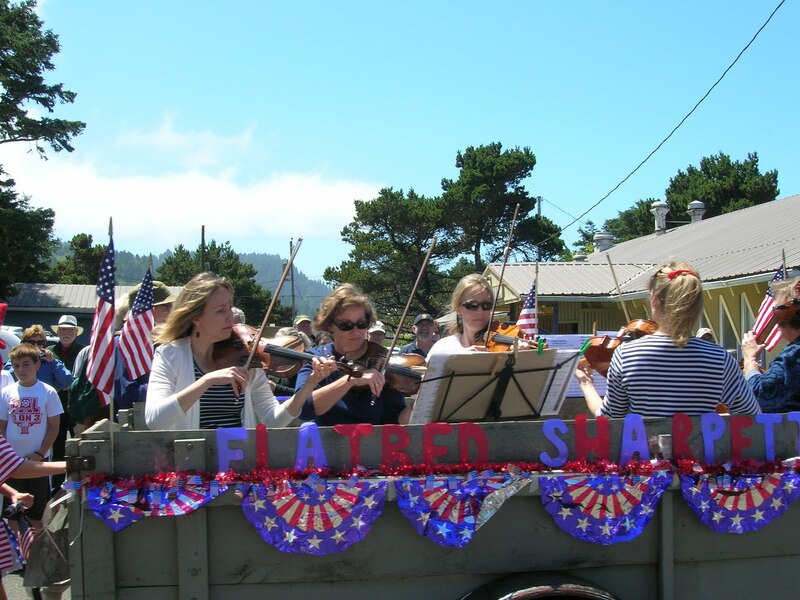 With temperatures in the high 60s and a sweet breeze, hundreds of people from all over hunkered along the sides of the roads for the annual parade that is like no other. Instead of precision marching bands, we had the umbrella drill team with actual umbrellas, a little girl in a wagon celebrating her fourth birthday, seniors doing tai chi, a string quintet playing in the back of a pickup, dachshunds wearing hot dog buns, belly dancers, ecologists dressed as trees, fire trucks, tractors and more. Marchers tossed candy and passed out cartoons and real estate ads. Poodles, labradoodles, spaniels, greyhounds and every other kind of dog marched or panted on the sidelines, dressed, like their owners, in red, white and blue or tie-dye. 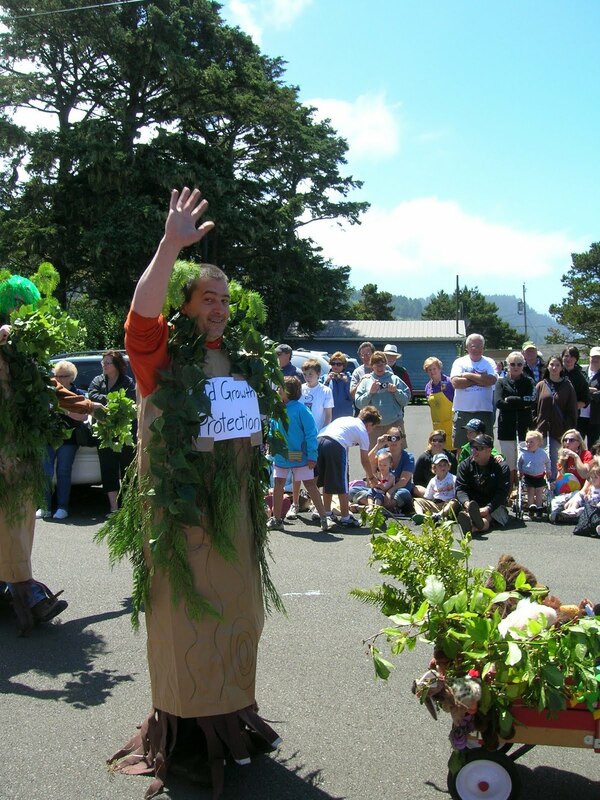 Once the parade had made its circuit from the Yachats Commons—a former school that is now city hall, community center, concert venue and everything else—down past the Lion’s Club and around the bend to where the road overlooks the rocks and crashing surf and back, the crowd dispersed to eat barbecue at the fire department or pie at the commons and shop at booths set up all around. Then they went home to rest up for Fourth of July fireworks over the bay at dusk. My friends and I adjourned to the Salty Dawg Saloon in nearby Waldport: great burgers, sports on the TV, sea shells embedded in the tables, and a giant photo of James Dean in the ladies’ restroom. This does not happen in Silicon Valley. I hate to advertise, but I must. My new book, Shoes Full of Sand, is out in paperback this week. If you like this blog, you’ll love this book. Click here to read about it. Next Next post: Dog Agility: Weave? Why?